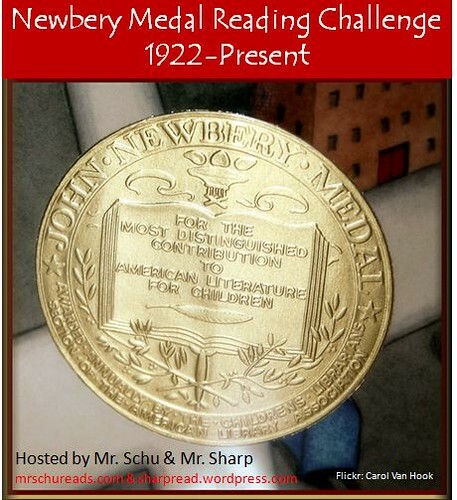 Click here to download a Newbery Challenge badge. Colby Sharp is co-hosting this challenge. Thank you, Colby! Grateful for the "stress free" element! Thanks, Mr. Schu and Mr. Sharp! This has always been a lifetime goal of mine. A fun idea, and your video made me very happy. Brought back many book memories. Love the part about taking four years or more! We'll see how I do. This is going to be fun and stress-free. Thanks for organizing this. I will participate. I may not be as motivated to read them in order as you, but I will read, tag, and post reviews of the ones I do read. I have a random question-your picture on your profile-where was that taken? I like a challenge self imposed and as a group...I plan on reading every one that I haven't read (and ones that I liked previously). I have decided this year to improve my reading of middle grade books mainly. So this challenge will give some incentive. Have read a few, Maniac Magee I have read a couple of times aloud to my class over the years. I am going to take the stress free number of years approach, and read in any order I like! This looks like a fun challenge and I LOVE that it is Stress Free! Sounds likes it will be fun and informative. Not too sure about the older titles - they may be hard to find but I am going to give it a shot. Would love to do this with my students too. I'm in - can't wait to start. Wow! I have read more winners than I realized. Loved the animoto. Excited to join in...just not sure how I will be doing it. Maybe I will start with present and work my way backwards. HaHa! Like Alyson above, I think I want to go present to past or even alternate as was mentioned on twitter. Otherwise, I'm afraid I won't make it. Will use my abandoned after so many pages rule though and spread out over a number of years! I have had this as a goal for the last two years - so it's about time I set an end date, 2012 it is! Not sure how many I've read (to myself or to my kids) so I'll have to let you know. John, thanks for organizing! I will be doing it at a tortoise's pace, but I'm happy to have a challenge to focus my reading. I think I will be reading backwards. I love this challenge - especially the fact that we are encouraged to tailor it to our reading lives. In order to keep up with new books AND go for this challenge I am going to try to read all the Newberys that were written by women authors. If time permits I will read the the ones written by men. I have taken KT Horning's online ALSC Newbery course twice. It's a six-week course in which all enrolled read one Newbery winner from each decade and share thoughts. I still have quite a few to read - more than 50! Thanks for the inspiration, and the stress-free atmosphere. I'm going for the 2 year plan! Anyhow, enough yacking from me. Thanks for leading the stress free charge and Happy New Year and enjoy being at the announcement for this years winner!! I'm excited to go back to work and get my hands on Dr. Dolittle and getting The Story of Mandkind from the Carnegie. I'm amending my initial reading challenge - now I'm going to read ALL the Newbery books! It only took me all day and all my patience to get to this point with the blog. I should have it figured out by the 10th or 20th book! I'll begin with most recent... just got it in the mail yesterday and the 1922 book is slowing me down! Wonderful stress-free challenge. This is something that I have always wanted to do, and now I have a real excuse - not that I really needed one! I am so excited to start this challenge. I just finished reading "The Book Whisperer" by Donalyn Miller. I thought I was reading enough throughout the year. Turns out I am not so I am ready to get started! I am not sure how I will read these. I might start with the ones that I already have in my classroom library. This will be a great kick start to my 2012 reading, and I appreciate the zero stress factor! I have never participated in a reading challenge before and being rather competitive, I cannot wait to try this one. I am reading them in reverse order, however, starting with the newest ones first. Awesome challenge! I'm going to take the STRESS FREE part to heart and challenge myself to read one Newbery winner from each decade this year. I've read lots from the more recent decades, but this will motivate me to check out the earlier ones. Thanks! I also love that this is a stress-free challenge. (Otherwise, I wouldn't have signed up for it!) Thanks for the inspiration. I have THE STORY OF MANKIND right now. . .on my way. . . I am very excited about this challenge. I, of course, have a difficult time doing things the same way as everyone else. So, I will be starting my #Nerdbery with Moon Over Manifest (2011) and then going back in time. I'll meet you all somewhere in the middle! I've been working on this goal for some time. Hopefully this will give me the extra incentive to read some of the older winners. So glad to have this challenge to motivate me to check out some books I may not have chosen otherwise - and to revisit some old favorites! Hi! We're also joining in this challenge. We are hosting our very own Award-Winning-Books Reading Challenge in our website, and we thought that it would most likely build a greater sense of kidlit love and community if we also join in this one. After all, the challenges do overlap. :) Good luck to us! I'm not sure if my earlier message went through. But let me rewrite, just in case it didn't. :) We'd love to join the challenge since it overlaps with our very own Award-Winning-Books Reading Challenge that we're hosting in our website. We feel that it'd foster a much lovelier sense of community among kidlit/YA enthusiasts to have all these reading challenges in the blogosphere. Best of luck to all of us. I started reading Newberry's when my son was little, but we didn't get through them all. Now is the time! I think I'll start this challenge on January 23rd when they announce the latest Newbery. I love reading challenges. I'm excited to have found this blog! Shamefacedly, I must say that the Newbery sticker usually causes me to put a book back on the shelf. I love checking things off a list (such a feeling of accomplishment! ), so hopefully this will make me pick up those books and give them a chance. I've been working on this for awhile so it's finally fun to have an official challenge to join! Hi! I just discovered the challenge today, so I will be playing catch-up for awhile. I am a reference librarian in our town's public library. I am excited to re-visit the Newbery books I loved growing up. found your challenge yesterday. i'm going to join you. i'm not a school librarian (but my aunt is) ... just an unschooly mom of 8, and we love good books. i don't think i'll be re-reading (for time reasons), and i'm going to start with the newberrys on our own shelf, then go back and forth between oldest/youngest. p.s. would you mind if i put your cover video in my sidebar ... although we are not supposed to judge a book that way, i think sometimes it inspires people to read when they actually 'see' the book. What a great idea, I'm excited to get started! I also want to make a Newbery section in my K-6 Library Media Center, and one for the Caldecott. I'm blogging my way through The Well-Educated Mind reading lists compiled by Susan Wise Bauer. This quest takes up a huge chunk of my reading time -- but since I have five children under age 9, and since I LOVE Newbery Award winners, I've decided to squeeze some in when I can. I created a page on my blog for this challenge. I've already read 36. I started reading the medal and honor books years ago. It is so nice to not read them in a vacuum and see others' reactions. I'm reading the winners/honors as I find them. I admire those reading them chronologically. Thrilled to be starting my Newbery Challenge with my 10-year old son. Here's to good reading. Looking forward to this fun challenge! What an amazing blog! I've linked my own, though my personal Newbery challenge isn't in any particular order. I started a similar project in 2010, as a focal point for a year of reading. I'm ready to dive back in and read the ones I've missed -- and reread the great ones. This is something I have been wanting to do for some time; I just needed that extra little motivation! Happy Reading. A little late to the party-- but I've been doing this in reverse. My hope is that by adding my name to the list, I'll actually read the ones that are more daunting. Woo Hoo, as soon as I saw that I would be number 100... well, I just had to sign up... better late than never! Thanks to you Mr. Schu and Mr. Sharp... I just checked out 'The Story of Mankind' to one of my Chinese-American 4th graders... I'm sure that wouldn't have been on his radar without our love of award-winning literature. I recently joined the challenge. This has been something I've wanted to do for quite a while. Thank you for hosting. Thanks for your blog and the challenge. I've kinda been working on reading the Newbery winners off-and-on for several years, but it is nice to get formal about it and accept the challenge. I'll be augmenting my Newbery challenge list with some other classic children's literature that hasn't won that award, either because it is too old or it is British or it just got passed over for whatever reason. I've been a member of the Newbery Project since maybe 2008. Glad to continue the challenge and start to keep track of what I've read -- and skip the ones not worth reading. Thanks for organizing! I started reading the Newberry winners when I started working in a school library in 2007. I've taken a hiatus since starting an MLIS program, but still manage to read a few each year. Glad others are on the ride with me!